Over the past four years, I have introduced thousands of developers to Electron. I’ve also worked with and on apps with millions of end users. All too often, I’ve dreamed about a tool that would make running small experiments, quickly compiling tiny apps, and the discovery of the Electron platform more accessible. I’ve seen how empowering “code playgrounds” like JSFiddle, Glitch, or CodePen can be for both newcomers and longtime veterans. Sharing code snippets, experimenting, and exploring the best possible solution to a problem certainly makes me a better engineer. Today, we’re releasing a first version of Electron Fiddle, an attempt to bring the same playfulness to cross-platform desktop development with Electron. You can download it here, but do read on for some of its more exciting features. Electron Fiddle lets you create, share, and play with small Electron experiments. It greets you with a quick-start template after opening — change a few things, choose the version of Electron you want to run it with, and play around. Built something cool? Found a bug that you need to share with the Electron Community? Want to share a small experiment without sending files back and forth? Share your Fiddle as a GitHub Gist – that way, other users don’t even need Electron Fiddle to see the code. Electron Fiddle can automatically turn your experiment into binaries you can share with your friends, coworkers, or grandparents. It does so thanks to electron-forge, allowing you to package your Fiddle as an app for Windows, macOS, or Linux. Fiddle is not an IDE — it is however an excellent starting point. 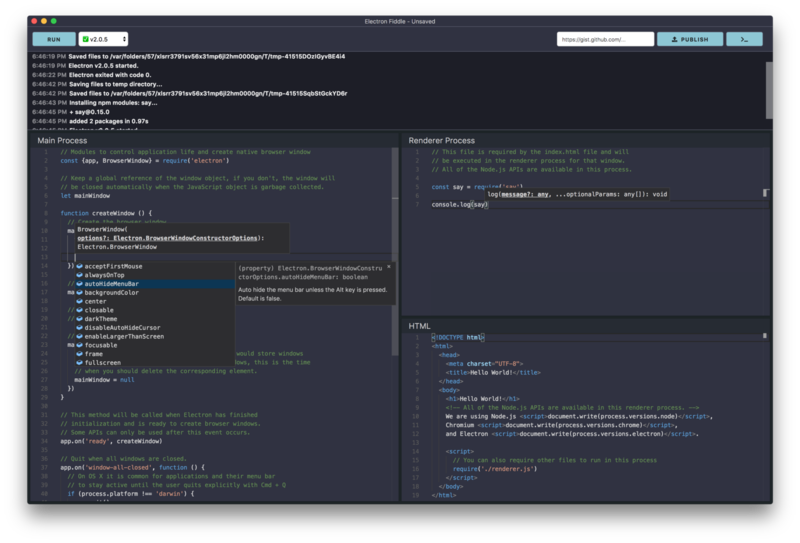 It features usage examples for every single Electron API. If you’re completely new to Electron, it’ll show you around. Once your Fiddle has grown up, export it as a project with or without electron-forge. Then, use your favorite editor and take on the world! Electron Fiddle is still in development and we’ve given it the version number 0.1 on purpose. Give it a try, an let us know if you encounter any trouble! Just like Electron itself, Electron Fiddle is entirely open source and developed by a group of volunteers. If you find a bug or feel like you could improve Electron Fiddle, come and join us! It’s an exciting code base to work on. Also, it wouldn’t be possible without the hard work of the maintainers of Electron, electron-forge, Monaco, and the many other dependencies we have. Thank you all so, so much.